It was all true in 1968, and it’s even more true today. Today I ran across an essay I wrote nearly three years ago, which exhorted cyclists to apply peer pressure to get each other to obey traffic laws. Upon reading it, I had two realizations. First, I realized that I still agree with every word. Second, I realize that the problem has (if anything) gotten worse in the past three years. Let me say it one more time, for the record: Cyclists, every single traffic law that applies to cars also applies to you! Obviously, peer pressure isn’t working. It hurts my libertarian soul to say what I am about to say, but I think the only answer is increased enforcement. Anyone on a bike who fails to stop at a stop sign or give proper turn signals, needs to be ticketed and pay a big fine. They are a public safety hazard and they give us few law-abiding cycle commuters a bad name. Anyone who can’t obey traffic laws doesn’t belong on a public road. If you feel the way I do, feel free to write a letter to your local police department asking them to enforce traffic laws for cyclist the same way they do for cars. If possible, send a paper letter. E-mail is too easy to delete; paper usually stays on file for a while. For most of the past two years I have primarily been a walker. I had been living in a loft above a downtown commercial building and had abundant retail opportunities within a few blocks of me, so there was hardly a reason to ride a bike, much less drive. In fact, I gave away my bikes to people who could use them because I hated to see them gathering dust. A few months ago, however, I moved to Riverside, CA, to go to grad school. Riverside is quite a bicycle friendly town (by California standards). It has well marked bike lanes in most major streets and bicycle buttons on many intersections. In general, I have found that motorists here hate cyclists much less than those in Los Angeles (who deliberately tried to kill me a couple of times). Too, most of the stores were much further from my new apartment than they had been from my old one. The supermarket is about a five mile round trip. I have no problem walking five miles to buy groceries, but it gets 110ºF (43ºC) here in the summer, and it was impossible to buy frozen food without it melting before I got home. I decided it was time to buy another bike. After a long search, I settled on the Union Flyer from Gran Royal. I have now been riding it for nearly two weeks, and feel ready to write a review. When I chose the bike, I knew I needed something simple and basic. After commuting for years on an 18 speed road bike, I knew I didn’t want to mess around with any more derailers or skinny high-pressure tires. Also I didn’t want anything too fancy because it would be locked on campus at all hours and was likely to get stolen or vandalized. The Union Flyer seemed to fit the bill and, at $140 (on sale at Nashbar) the price was right. 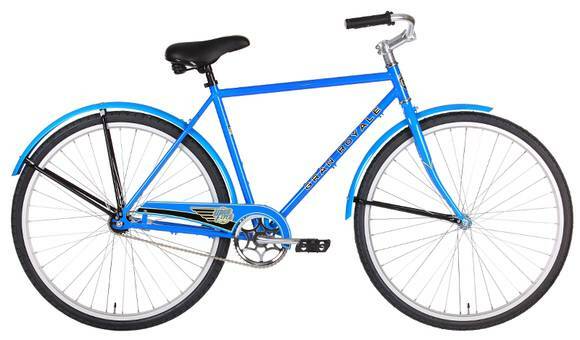 The bike has classic lines, reminiscent of English Raleigh and Hercules bikes from the mid-20th century. Gran Royal calls it a “single-speed comfort bike” but most of the world would probably think of it as just an ordinary. It uses an American style one-piece bottom bracket–not surprising, since Gran Royal is owned by a BMX company. All the other components, from the 700×32 wheels to the threadless headset, are modern and metric. The only brake is a Shimano coaster hub. The design is simple, and should need very little maintenance beyond repacking the hubs every couple thousand miles. This is a bike that will probably last longer than I will. The price, as mentioned above, was quite affordable. The frame is heavy, but the welding is clean and the alignment is good. Steel is real! The bike has full fenders and a chain guard so I can wear nice pants without them getting trashed. The overall look of the bike is quite classy and gets noticed by people around the bike rack. All in all, I am delighted. The paint is pretty but seems overly delicate. Already I have several small paint chips. I can see myself repainting the whole bike in a year or two, or even getting it powder coated. The hand grips get a little slippery when my hands are sweaty (see above about the hot summers here). I am thinking about trying a different brand. I have a bit of a love-hate relationship with the coaster brake. I like the simplicity of it, but I am having to revise my whole riding style. For example, when stopped in traffic at an intersection it is impossible to track-stand. Also, to get going, I need to change feet. I have accidentally locked the back wheel a couple of times when I was bunny-hopping potholes and brought my feet back too far. I think that most of these problems have more to do with changing my technique than with any problem with the bike itself, however. The bike comes standard with a 44T chainwheel and an 18T cog. This works out to be about a 5.5 gain ratio (using Sheldon Brown’s calculator) which is probably fine for a bike path, but is a little too high a gear to climb a hill with a load of groceries. I installed a 20T cog (5.0 ratio) and realized an immediate gain in rideability (total cost less than $10, including shipping). Rod Brakes – Which are almost impossible to find in this country, but this bike would be a perfect application. They would be as durable as the coaster, but much more effective. Lower Gearing – As described above. 44X18 seems perfect. Of course the rod brakes are a fantasy and the gearing is cheap to change in the field. I am really rather happy with this bike as it is. I realized last night that I hadn’t logged into this blog in over two years. I’d like to say a big “sorry” to all the poor people whose comments have been in blog-limbo all this time, waiting for me to mod them! It’s hard to say why I haven’t been posting. Certainly, I am still really pissed off at the way our transportation system works here in North America. If even one person who reads this blog is inspired to get rid of their car, or grows up to be a decision maker and enact pedestrian friendly policy, then I have made a difference. And it helps me to have an outlet for when I’m angry at the system and slightly buzzed. It should be hard to get a drivers license–hard enough that anyone who doesn’t need one or shouldn’t have one won’t get one. As a start, we could make the exam more difficult, require yearly medical checks, and require people to hold a learners permit for three or four years before the apply for a full license. Roads and buildings should be designed for people and bicycles, not cars. Cars can use the space that is left over after the sidewalks and bike racks go in. Parking for cars should be extremely limited. No housing tract or apartment building should ever be built more than half a mile from a grocery store. Ideally, retail and residential occupancies should be well intermixed so people can easily walk to shop. It should be much more expensive to register large vehicles than small vehicles. This could be implemented by a tax schedule that goes up in relation to weight, height, or engine horsepower. It isn’t feasible to outlaw all cars. Contractors and house movers, for instance, need to be able to buy trucks (but should be made to jump through many hoops to get them). Disabled people or people with small children might need to drive golf carts. I don’t really have a problem with golf carts, as long as they are small and can’t go any faster than a bicycle. A golf cart license should be like a concealed weapons permit: they only give it to you if you take a class and come up with a plausible reason why you need it. No one should ever be allowed to design another intersection with a pressure plate. Every time an engineer puts in a pressure plate, it’s like saying “screw you” to bicycles. Actually, 95% of existing intersections could be redesigned to be more bicycle friendly while constricting automotive traffic. Bicycle education should go back into elementary schools. No one should get past fifth grade without being trained in basic bicycle safety, riding technique, and maintenance. All traffic laws should be enforced at least as severely for cyclists as for motorists. Bicycles will never be accepted as a mature mainstream mode of transportation while most cyclists keep acting like children: running red lights and ignoring hand signals. The other day I was given a folding bicycle. I have wanted one for some time, because it seemed like it might be a good way to take a bike on buses and light rail trains. When I put my bicycle on the rack at the front of the bus, I always worry that the driver will drive off before I can get it off. OCTA even has a 1-800 number for claiming lost bicycles. On the subway, of course, you walk your bike right onto the train. At rush-hour, though, you get a lot of glares from people who want to stand where your bike is. Now that I have the folder, I am a little dubious that the bus drivers will let me carry it on. Even folded, it is still sort of a bulky package. For the train, though, I can see that (even unfolded) a 16” wheel bike is going to take up a lot less real estate than my 700cc road bike. 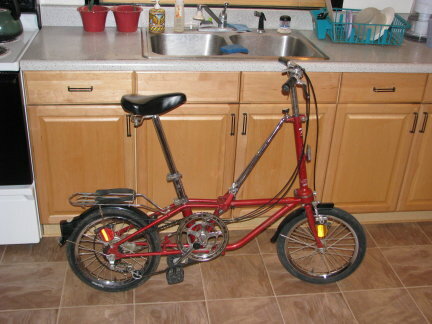 My folder is a vintage Dahon, which was bought new by a pilot acquaintance of mine. (Plane+folding bike, how’s that for a car free mode?). It has a steel frame and weighs about half again what my road bike does, so it will probably be no fun to hump up the stairs on the subway. After I cleaned it up, I rode it for about 4 miles on the Whittier Greenway. The short cranks are going to take some getting used to, and the brakes are certainly not as strong as I am used to. That being said, I was surprised how fast I could cover ground. The next step is to take the bike into the city and see how it does. Stay tuned for my conclusions. Back at the beginning of this year, I bought a new scooter. Needless to say, I formed some pretty strong opinions about the new machine within the first couple of weeks. I restrained myself from writing a review right away, though. I though it would mean more after I put a thousand miles or so on it. This morning I looked down at my odometer and saw 1749 km, which works out to about 1050 miles. I chose a 150cc scooter because it is big enough to go 60 mph on arterial streets, but small enough to be fuel efficient and easy to park. There are hundreds of models of 150cc scooters on the market. I chose a Kymco because they have a reputation as a reputable company, with offices in the US and a 2 year warranty. Kymco makes a lot of the fact that they use ISO 9001 quality control. I thought that a Kymco would be reliable “out of the box”. If I had it to do over, I would still buy a 150cc scooter, but probably not a Kymco. The scooter handles great. It points well, and the front-back balance is as good as any motor bike I’ve owned. The wheels are big (16″), which helps a lot on the crappy blacktop we have here in Los Angeles. Kymco seems to use a better grade of hoses and lines than most of the mainland scooters. The carburetor and other parts are made by vendors whose names I actually recognized. The luggage rack, which looks like it would be small and useless, is surprisingly handy. I do wish, though, that they had made it out of metal. The paint is already wearing off of the plastic. Then again, I haul a lot more cargo with my scooter than most American’s, because I do not own a car. From the beginning, the scooter has had an annoying and dangerous habit of stalling unexpectantly in traffic. Initially, I tried to get it fixed under warranty. The clueless dealer called Kymco and was told that I, the owner, had probably over-filled the gas tank and swamped the evaporative emissions canister. Kymco send out a new canister, which did not fix the problem. the mechanic mentioned that KymcoUSA is “sort of hard to deal with”. Apparently many California-model Kymcos have fuel system issues because of the after-thought nature of the emissions system. It occurs to me that if the gas-tank vent line were to vibrate off the check valve, then the problem would go away with no noticeable decrease in performance… Get it? Got it? Good. My own problem had nothing to do with the fuel system, however. Once I gave up on the dealership and the warranty process, I eventually tracked it to a defective CDI module that was overheating. So much for ISO 9001 quality control. I put on a $25 generic module that seems to have fixed the problem. All in all, my new scooter was unreliable and dangerous for about four months while I spent hours working on it. Next time, I will just get one of the cheap no-name scooters. I’ll probably still need to spend a few weeks fixing the bugs, but it will cost about 1/3 the price. I paid a lot of extra money for a scooter that I thought I would not have trouble with, and that money was wasted. That being said, the scooter is working out for me now. I’ll probably keep it for at least a couple of years before I trade it off. 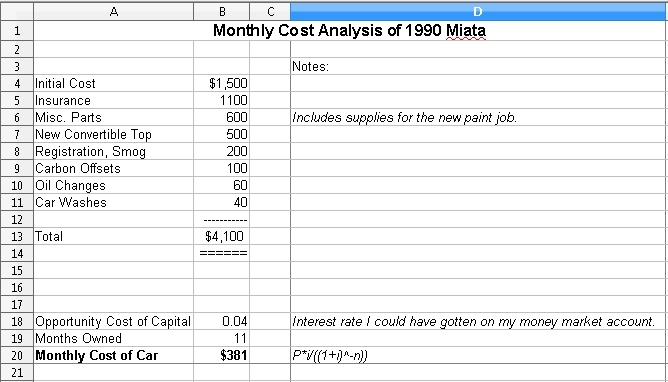 Its been more than six months and I still do not own an automobile. The other thing that has not changed, is that I am still horrible at posting regularly to this blog. The problem is not a lack of material. Believe me, I have not problem coming up with a rant about transportation. The problem is that they usually occur to me when I am in the middle of traffic on Sunset Boulevard at 5:30 on a Friday night–not the best writing conditions. By the time I get home, I am so tired and glad to be alive that I forget to blog. Luckily, all of this should change soon. I just went back to school. Given that I will be in front of my laptop for over 20 hours a week, doing anything to avoid typing my assigned essays, I can confidently say that more blog posts will be forthcoming. Why Won’t the Working Class Go Green? Here in LA traffic jams have become a sort of a tradition on the first week in May. That is, worse traffic jams than usual. Immigrants and laborers stream on the streets to demonstrate for their “rights”, blocking downtown traffic for hours. It poses no problem, of course, for people like me who travel by bicycle, but all of those crowds lead one to start thinking about immigrants and the working class in general . I can sympathize with immigrants rights. My own people were poor Irish farmers who worked like dogs for the first hundred years they were here before finally breaking into the middle class. I am not sure how much help they should get from the government; we did not get any help at all and we did alright. That is a civil rights issue, however, and this blog is about transportation policy. There is one observation I can make about working class immigrants which is apropos to my topic: they tend to be completely apathetic about the environment. I need to make a disclaimer. All of the statements I am about to make are based on completely anecdotal evidence. I have a feeling, however, that the statistics would bear me out. During the week I usually spend the night in the town of La Habra, California. It is not a place I would ever have chosen to live, except that it happens to be where my office is located. It is a solidly working class town with a majority Hispanic population. Most of the town was designed in the 1950’s which means that the whole town is functionally obsolete. In other words, it is almost an exact carbon copy of every other working class neighborhood in Southern California. As bad as the situation is, the really sad thing is that none of the population sees anything wrong. Its as if they just have not been paying attention to the news for the last twenty years. In La Habra (and all of the other towns like it) it is still 1989. The middle class in North America is already changing their lifestyles, but the working class is not with the program at all. Considering that there is now more of them than their is of us, it is becoming imperative that we get through to them. How do we do this? Environmental ads on ESPN? Spanish language flyers? Maybe critical mass bike rides down La Habra boulevard? I have no idea. It may surprise my readers to know that I spent most of this weekend on a stationary bicycle. After all, I walk to work and use a bicycle for most of my shopping. Why would I want to spend even more time exercising? I walk two miles each way two and from work. I bicycle every chance I get but I do not like to ride too far in the dark. Considering that I leave for work before dawn and do not get back until after dark, this cuts into my riding possibilities. All in all, I only seem to be walking and riding about twenty miles each in a typical week. That’s not even enough to stay in shape. So much for giving up my car being a lot of work and exertion. I am training for some pretty big rides right now, including a century in May for The American Diabetes Association. To feel like I am even remotely prepared, I try to get in 80-100 miles of cycling every week. Thus the stationary bike for five or six hours per weekend. I bring all of this up for a reason, of course. That reason, as you the reader have probably already guessed, is to hit you up for money. It may seem like Diabetes has no relation at all to an anti-car blog. A little thought, however, will quickly show that there is indeed a connection. The rate of diabetes is increasing dramatically in this country. In fact, as many as 40% of Americans will probably develop the disease over the course of their lives. Adult-onset diabetes is a symptom of America’s lazy, indulgent, energy wasteful lifestyle. Most people who developed diabetes are over-weight and out of shape…often because they have spent their whole lives driving cars when they should have been cycling or walking. Overuse of cars contributes to the diabetes epidemic. Take away the cars, and we will have less diabetes. In the men time, while we work to eliminate private car ownership, the good people of the American Diabetes Association work to educate people about the disease and how to prevent it with exercise and a healthy diet. If you would like to support them, the best way is by sponsoring me in the Tour De Cure in may, which you can do here. The added benefit is that every time we ride in a highly publicized 60 mile (100 km) ride, we have the chance to raise awareness of bicycling as long distance transportation. Next time someone tells me that five miles is too far to ride to work, I am going to point out “Five miles? I’m riding 60 miles for the American Diabetes Association”. See how that works? It has now been exactly one week since my Mazda Miata blew its head gasket–one week of being car free. Ecology Auto Parts towed my Miata away on Thursday and all I felt was an all-consuming sense of relief. Cars are like a heavy weight on your soul. Get rid of yours and see how great your feel! My $1500 compact car cost me nearly $400 per month, not counting gas! Of course if it had survived for a few more months I could have amortized the expenses over a longer period. Even so, the cost was really too high for what I was getting out of it. Also, I should point out that I did all of my own mechanical, paint, and body work. About the only thing I paid someone else to do was change the oil. If I had had to pay labor on all of my maintenance it would have cost much more. Of course, the first week has not been without its hiccups. I forgot to look up the bus transfers the night before to get to a doctor’s appointment. I ended up borrowing a car for a couple hours so I could get there on time. Friday, I had run to downtown LA on business in the afternoon and there was no point in going back to the office, so I have been stuck with a pickup all weekend. Still, these things are minor and it is only the first week. Things are going great for me since I lost the car. Please, think of following my example. Living auto-light is a start, but you really do not receive most of the benefits until you are totally auto-free. One organization in my part of the world that helps people transition to an auto-free lifestyle is Auto-Free Orange County. Check them out.